Providing family dentistry services since 1984, Dr. Liza A. 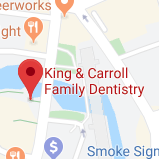 King, Dr. Patrick Carroll and our team of highly-trained, friendly dental staff welcome you to our practice. Here, we listen to your needs and concerns to develop treatment plans that work for your needs, goals, and lifestyle. Our practice believes in providing you with dental care that is affordable and effective, in a warm and comfortable environment. We respect you as an individual and thrive on the relationships that we develop, whether we see you for regular check-ups or you need more intensive treatment to rectify an oral health issue. We serve dental patients of all ages, including children and seniors, at our Dover, NH office. Our patients come from New Hampshire’s Dover, Rochester, Portsmouth, and Exeter areas, and from York, Kittery, and the Berwicks in southern Maine, as well. For more information about our practice and how we can help you achieve excellent oral health and a stunning smile, please call. We look forward to getting to know you!